Hewlett-Packard has a lot riding on the launch of the TouchPad. The tablet, which went on sale last week, doesn’t just represent HP’s effort to take on the iPad. It’s also the start of what the company hopes will be a renaissance for webOS, the operating system HP acquired with its acquisition of Palm a year ago. Perhaps the high stakes are what prompted webOS unit head Jon Rubinstein to pen a memo to troops in the wake of tough reviews for the TouchPad. In the memo, which was obtained by PreCentral.net, Rubinstein notes that other eventual hits, such as Mac OS X, also arrived to a mixed reception. “We still have work to do to make webOS the platform we know it can be, but remember … it’s a marathon, not a sprint,” Rubinstein told his team. HP declined to comment on the Rubinstein memo. 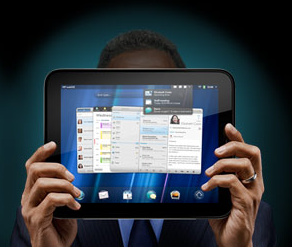 In recent interviews HP executives have talked about the importance of webOS to the core of the company’s business. HP is counting on webOS to power a range of devices, from future tablets to the Pre3 and other smartphones. HP is also looking to boost the operating system’s presence by making it available on printers as well as from within its Windows PCs. Bradley wouldn’t commit to a schedule for when future devices would hit the market after the already announced Pre3, but he said the company is committed to a broad webOS lineup. In recent weeks, HP has also indicated that it is open to licensing webOS to other device makers as well, a position voiced by CEO Léo Apotheker during his appearance at last month’s D9 conference. “Our focus always has been to make webOS available to partners that expand the ecosystem, and we will continue to be open to that,” Bradley said. Of course, Bradley doesn’t need a reminder that licensing an operating system while using it in one’s own products can be a tricky proposition. Bradley learned that firsthand during his own stint as head of Palm. Rather than license the OS to companies that would compete head-on with HP’s webOS products, Bradley suggests that the company is most interested in licensing to companies that would take webOS in a new direction. “That’s exactly what we would look for, someone who would go in spaces that we are not in,” Bradley said. In the meantime, HP faces the formidable task of trying to get developers to write software for webOS, even as the base of devices running the software remains relatively small. On the tablet side, the TouchPad launched with just a few hundred apps, while webOS boasts a few thousand phone apps. That compares to more than 100,000 apps for the iPad and several hundred thousand apps for both the iPhone and Android phones. The arrival of the TouchPad allows HP to transfer its talk into reality for the developers it is aiming to woo. Kerris said that most developers are interested, though some are taking a wait-and-see approach. “We’ve not had any developers say we don’t want to be on your platform,” Kerris said. The company is also aiming to appeal to the smallest of developers, even encouraging hobbyists to tinker around with the core operating system in ways frowned upon on other platforms. HP PC unit CTO Phil McKinney took a prototype of the TouchPad to the recent Maker Faire event, showing off how the tablet could be used to control temperature by turning on lights or a fan. One option that HP says it is unwilling to pursue is the path of paying developers to port their apps to webOS. That said, Kerris is convinced that the resources of HP will allow webOS to succeed in ways that it never did as part of an independent Palm.